Construction bid bonds ensure that the low bidder on a construction bid will move forward with the contract. It is a means of prequalification to assure the job owner that the contractor is capable of performing the work. Learn more about this type of bond below, or contact our experienced surety agents for assistance with any questions you may have. Imagine going to all of the trouble to advertise a construction project, solicit bids from contractors, evaluate those bids, and offer a contract to a qualified bidder, only to have that bidder say “Thanks, but no thanks.” That’s the situation that construction bid bonds are intended to prevent. A great deal of effort and expense goes into the bid advertisement, solicitation, and evaluation process, and having to start all over again can be a sizeable expense. A bid bond is a type of construction surety bond that gives project owners some recourse and financial protection in such cases. The most common reason that a contractor may turn down a contract is realizing that the project can’t be done profitably for the bid amount. Sometimes a contractor only discovers that after submitting a bid. This may occur because a critical cost factor was inadvertently overlooked, a subcontractor revised an estimate upward, or materials can’t be procured for the price the bid was based on. Additionally, contractors will sometimes bid on multiple jobs even knowing that winning more than one could pose a capacity problem. Failing to obtain a performance bond may be another reason for a winning bidder not accepting a job. Most often, the terms of a bid bond also guarantee that the contractor will purchase performance bond if awarded the contract. 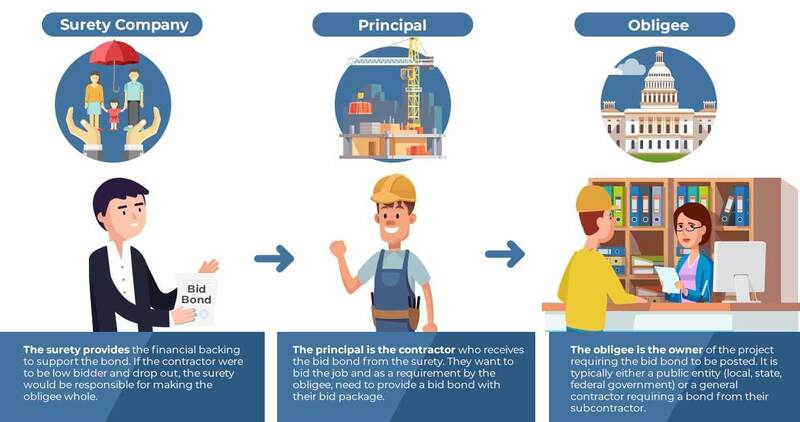 Whatever other requirements may be built into the terms, a construction bid bond is essentially a contractor’s guarantee to accept a contract if chosen as the winning bidder. With money on the line, contractors are less likely to bid frivolously, and project owners won’t lose out if they do. It’s up to construction project owners to decide whether or not to require contractors to submit a bid bond along with their bids. These bonds are not a statewide requirement. However, state and local agencies sponsoring public works projects funded by taxpayer dollars do typically require contractors to post bid bonds in order to submit a bid. Many private project owners and general contractors do so as well. The larger the project, the more likely it is that this type of surety bond will be required. Often, a project owner will require bidders to purchase a “suite” of construction surety bonds. This generally includes a bid bond, performance bond, and payment bond. Non-winning bidders can simply cancel the other bonds for a refund. Both general contractors and specialty subcontractors (e.g., electricians, plumbers, and HVAC) may need to purchase this type of bond in order for their bids to be accepted for consideration. The obligee establishes the terms of the bond and has the right to file a claim against it if the principal violates those terms by not accepting a contract resulting from a competitive bidding process. The principal has the right to submit a bid for due consideration and guarantees to accept the contract if offered. The guarantee may extend to purchasing a payment and performance bond as a condition of the contract award. The surety charges the principal a premium for the bond and accepts financial responsibility for compensating the obligee for a valid claim against the bond. What Happens When A Claim Is Filed? If the winning bidder turns down the contract, the obligee will submit a claim against the bond to recover any financial loss that results from the contractor’s decision. For example, the obligee may have to make changes to the project plan due to the additional time and effort it takes to select a new contractor. A new RFP or bid solicitation may need to be developed and advertised. And time is money in such matters. There may also be a ripple effect that magnifies the impact of the contractor’s decision. Imagine a commercial retail project in which rental agreements are signed for anchor stores months before ground is broken on construction. A project delay of even a couple of months can have significant financial repercussions. The full impact of the winning bidder backing out may not even be known for some time. Once a claim has been filed against the bid bond, the surety will conduct an investigation to determine whether it is valid. The surety will pay any claim that it finds to be valid and will then seek repayment from the contractor, which may include interest and penalties as well as the damages paid to the obligee. In addition to the financial cost of a claim against the bond, the contractor’s reputation can also suffer to the point that it becomes a handicap in obtaining future bid bonds. That would prohibit the contractor from competing for future contracts that require bid bonds and could spell financial ruin. The best way to avoid a claim is to bid responsibly on projects that you are prepared to complete. The project owner (obligee) determines the required amount of the bond. This is generally in the range of 5%-10% of the total contract amount. Bid bonds obtained in conjunction with a performance bond may not cost you anything. While some surety companies charge a fee for bid bonds, we do not at Surety Bond Professionals. These bonds are usually given with the intention that a P&P bond will be issued (and charged) if you are low on the project. For smaller contracts and companies, the contractor’s personal credit history is the primary underwriting consideration. For larger contracts, the project’s location and the contractor’s financial history and stability may also be scrutinized by the surety’s underwriters to determine the final cost. Whether you need only a construction bid bond or a bid bond plus performance and payment bond, Surety Bond Professionals is here to help. We have over 30 years of experience providing construction surety nationwide. Simply fill out our online quote form to get started!